Washington Wizards guard Bradley Beal is shoved by Atlanta Hawks guard Jeff Teague in the first half of Game 3. It was a play added to the Washington Wizards' offense a day earlier, and it was drawn up for a guy, Paul Pierce, who's been doing this sort of thing for the better part of two decades. With three defenders near him, Pierce made a fallaway, 21-foot jumper that went in off the backboard at the buzzer to lift the Wizards over the Atlanta Hawks 103-101 on Saturday night, despite playing without John Wall and after letting a 21-point lead evaporate. As he left the court after giving the Wizards a 2-1 lead in the Eastern Conference semifinal series, Pierce was asked on TV whether he called "Bank!" on the winner. "I called, 'Game!'" Pierce declared. He had more fun at his news conference. "Usually," Pierce said, "I like to save those type of shots for later rounds." Told that Dennis Schroder, one of the Hawks who tried in vain to disrupt the game-winner, called it "a lucky shot," Pierce chuckled. Then, referring to his lengthy career, Pierce retorted: "Well, I guess Schroder is going to say that, because he's a little young. ... He hasn't been able to see it over the last 17 years." Pierce is 37, and he has a nerve in his back that acts up from time to time, including in the first half Saturday. He won a championship with the Boston Celtics in 2008, and is well aware that time is running out on his career. "I'm still soaking it up," Pierce said, "because I don't have too many more of these left." Game 4 in the best-of-seven series is Monday night at Washington. It was the second straight day a bank shot at the buzzer won an NBA playoff game. Derrick Rose hit a 3 off the glass to give Chicago a 99-96 victory over Cleveland on Friday. On Saturday, Washington was missing Wall, its All-Star point guard, for a second consecutive game because of a broken left hand, but it was the Hawks who seemed out of sorts most of the evening. The Wizards led by 21 with less than 10 minutes left. 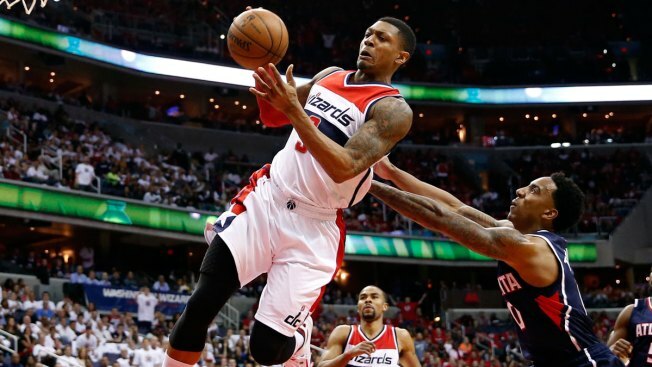 "We got comfortable," said Bradley Beal, who had 17 points and eight assists for Washington. "We thought the game was over." Even Hawks coach Mike Budenholzer put it this way: "You feel like you're not going to be able to close that gap." Yet Budenholzer's small lineup of little-used reserves made things interesting. A 17-0 run got the visitors within three points with less than 3 1/2 minutes remaining. And Mike Muscala's 3-pointer with 14.1 seconds left tied it. But Pierce came through as the clock hit zero, releasing the ball with about a second to go, then falling to his back on the court with arms aloft. "Took my time. You know, wanted to make sure I got the shot off with no time on the clock," Pierce said. "I've been in those situations many times." Beal was the first teammate to reach Pierce, throwing punches at the veteran's chest. The rest of the Wizards then mobbed Pierce, with Wall jumping up and down near the pile. When Pierce rose, Wall pulled off his teammate's red headband. "Luckily we didn't all get on top of him," said Otto Porter, who scored 17 points for Washington. "Just try to save his body for the next game." Pierce finished with 13 points, including three of the Wizards' 10 3s. "That's what he does," Atlanta's Kent Bazemore said. "He's a future Hall of Famer. He's been there before. His favorite (saying) is, 'This is why they brought me here,' and he showed us." Hawks: Schroder and Jeff Teague led Atlanta with 18 points apiece. ... Paul Millsap was out of the starting lineup because of flu-like symptoms and looked lethargic once he was on the court. He had eight points and two rebounds. Wizards: Their 28-18 lead after the first quarter represented only the second time this postseason the Wizards have led after 12 minutes.